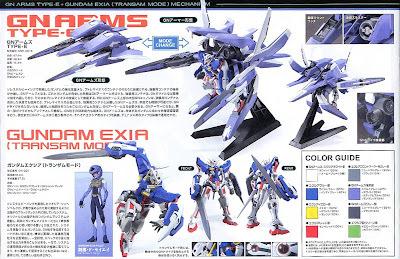 5,500 Yen (about SGD 83.00) plus Shipment Charge 4,000 yen (about SGD 60.00) coz it's quite heavy - not cheap for a 1/144 High Grade kit but then again if Bandai make the MG Kit for this model, I think the price might be close to PG Kit (not to mentioned the box will be as big as PG box or maybe bigger than that). 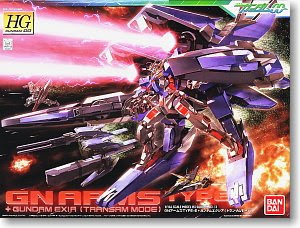 The Exia is sure easy to assemble, well it's a 1/144 scale kit - as I mentioned above, at the moment I just assembled the GN Arms unit and will only do the Exia Trans Arm Mode later. The GN Arms is almost like a MG kit but despite the many parts basically it's quite straight forward, nothing that is too difficult, it is time consuming though but not difficult. Wanna know how to dock the Exia into the GN Arms? I also tried the GN Arms Type E with Dynames, actually Dynames have his own GN Arms, the Type D.
Fit perfectly well without problem whatsoever.